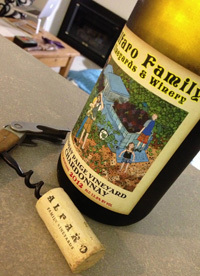 2012 Alfaro Family, Chardonnay, Lindsay Paige Vineyard, Santa Cruz Mountains. As a longtime fan of Richard Alfaro’s wines, especially his Chardonnay, it is always with great expectations that I look forward to the newest releases, and this one was no exception, in fact I was already primed for it as Richard had told me repeatedly that 2012 was an awesome vintage, so I was jazzed and thrilled to open this new Lindsay Paige Vineyard Chardonnay from his Santa Cruz Mountains estate near Corralitos not too far from the cool Pacific Ocean. I can certainly tell you beyond any doubt, I was not in anyway disappointed, Alfaro has crafted another profound and moving wine that is pure class and very hedonistic, pleasing from start to finish with gorgeous fruit, body and vivid flavors. The nose starts off with white flowers, steely minerals, peach and citrus leading to a lush palate of creamy lemon, apple, pear and pineapple with hints of smoke, hazelnuts and river stones along with nice french oak notes and a hint of butter and vanilla. This luxurious Chardonnay still has plenty of tangy acidity underpinning everything and is totally glorious, a wonderful artisan wine.